Excited to share a new Whole30 recipe with you guys~ a side dish! I have really loved the new organization on my blog for sorting my recipes by category, and loved that you guys have given me great feedback on it too! It makes older recipes SO much easier to find, and is much more user-friendly when navigating by category. The recipe index has also been a great visual for me to see where I'm lacking as far as categories go. One area I noticed was side dishes... so I figured I would start sharing some of those go-to sides that we make all the time but I haven't thought to share. 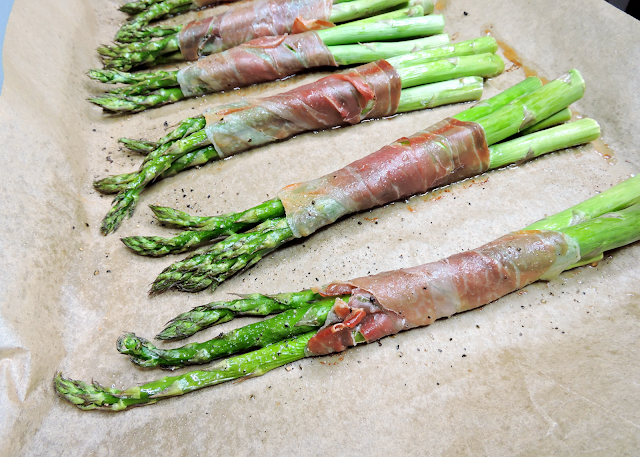 This is one~ bundles of asparagus wrapped up in prosciutto... then crisped up in the oven. I had seen the idea before, but didn't get around to trying it until Dathan's brother and sister-in-law made it for us one time when we were over for dinner. It looked so simple, and tasted so delicious! Pretty sure I would eat much more green veggies if they were all wrapped up in prosciutto... or bacon. ;) Enjoy! & Thank you, Drew & Jessica, for sharing your recipe with us! 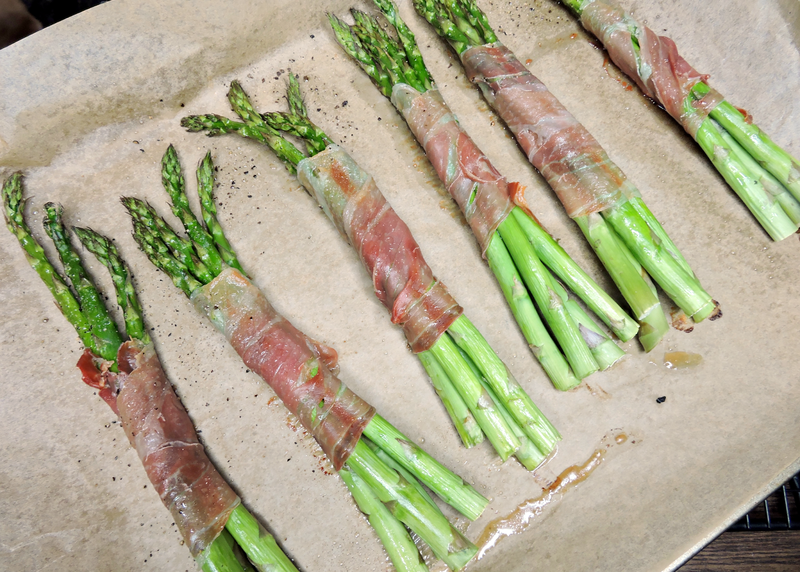 Lay out one slice of prosciutto on a clean, flat surface (I use my cutting board), and place 4 asparagus spears in the center. Wrap the prosciutto around the asparagus spears at an angle, and roll them up into bundles. Repeat with the remaining prosciutto & asparagus. Place the "bundles" on the baking sheet & spray with olive oil spray. Top with a dash of sea salt & fresh cracked pepper. 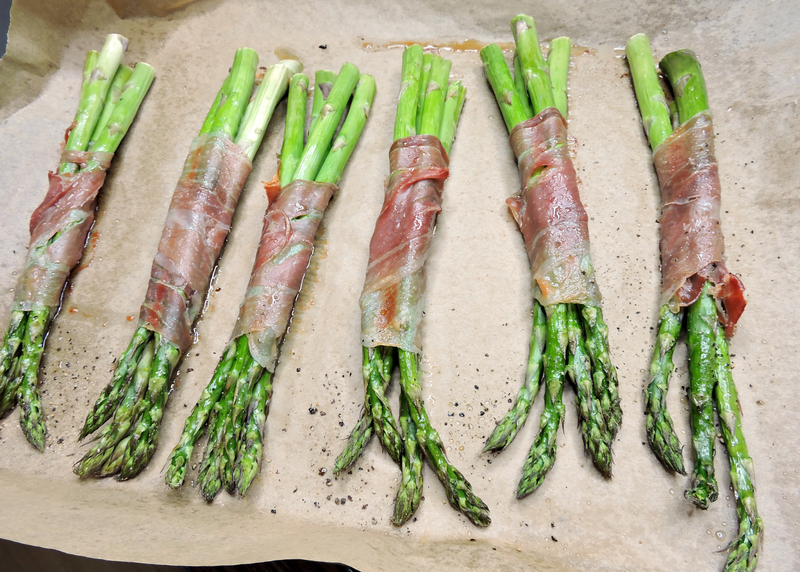 Bake for 15-20 minutes, or until the asparagus is cooked & prosciutto is crispy. I broil mine the last minute or two for extra crispiness! I use a "Misto" sprayer where you add your own olive oil. Use whatever spray you like, or lightly drizzle the oil instead.